Commercial TV channels and their media sales teams are rightfully optimizing programming schedules and ad breaks to maximize for reach and “deliver” GRPs to advertisers. However, ad breaks in linear TV trigger natural, very predictable but also very negative reactions: audiences tend to change the channel or lose interest in the TV. So, while it perfectly makes sense to “monetize on eyeballs” when the reach is high, it also opens up doors for potential outbound churn which doesn’t just harm subsequent content, but also irreversibly lowers the performance of the upcoming ad blocks. In other industries, it is very difficult to manage churn, since you cannot anticipate fully what your competition is doing. In terms of linear TV, however, the situation is uniquely different: you always exactly know the schedule for content and ad breaks and can broadly predict general audience movement. 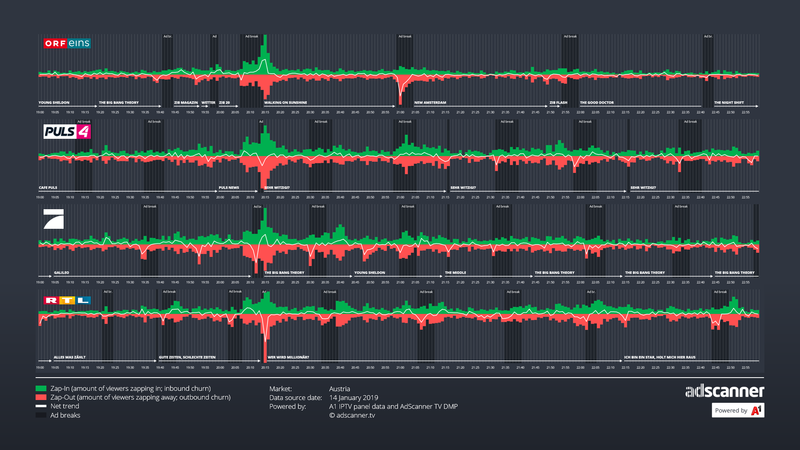 In the actual raw data, we could identify a significant migration from ORFeins to PULS 4 during the ad block on ORFeins, resulting in temporary net gains at the end of “PULS NEWS”. This is usually an indicator that audiences are willing to stick around for the upcoming content, which is a great lead-in scenario. However, even the very short ad block on PULS 4 just before 20:15 results in a very strong migration of its own and in a net loss of viewers. Even though the show “Sehr Witzig! ?” is popular and one of the Top 10 events of the day, it never manages to acquire significant net gains until after its first ad break. In fact, our data shows that many viewers who had previously switched from ORFeins to PULS 4 were now switching back to ORFeins. As the TV market is slowly gearing towards digitalization (addressable and programmatic business models), the ecosystem around broadcasters, agencies and advertisers is increasingly embracing the new status quo: just like the use of data in digital advertising has completely changed the way we plan, execute and measure digital campaigns — TV can learn a lot from that by employing smart data to optimize for significantly better results. One of the key sources for this new generation of TV data are telcos with digital TV offerings. They are generating gigantic amounts of actual user data, scalable and sustainable through compliant opt-in models. As an example, the data we use and enrich comes from our cooperation with A1 Telekom Austria Group and the resulting IPTV panel. 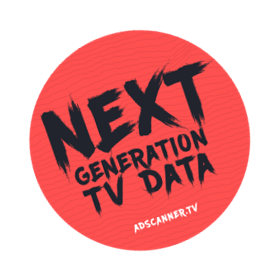 AdScanner offers a TV DMP solution for data-driven TV advertising and control. We help optimize our clients’ TV strategies, stay on top of their competitors’ activities and deliver a higher degree of transparency and speed overall in the TV ad ecosystem. We have developed a proprietary video recognition for the automated detection and analysis of TV ads and content. We integrate all identified ads and metadata in our user-friendly Cockpit dashboard, coupled with next-generation audience measurement data from our own A1 IPTV panel of over 4.000 households. This enables us to give unique quantitative and qualitative insights into the performances of TV campaigns and TV content — on a second-by-second basis. Interested? We’d love to hear from you and show you how we can help you take your TV game to the next level.